This occurs because I do not use Amazon's own print service. Why? A couple of reasons, the main one being I cannot get author copies of my own books shipped to Australia. Big incentive right there NOT to use them. Plus using Amazon's print service only makes the paperback available on Amazon, they don't provide wide distribution, meaning I would need to setup the paperback on another print-on-demand provider to get into bookstores, libraries, and other online sites. Instead, I use a print-on-demand company called Ingram Spark for all of my paperbacks. They will distribute my book worldwide, no issues. Book stores and libraries can order my paperbacks from their catalogue. Easy. Simple. Except on Amazon where they penalise me for using Ingram Spark as my printer on their platform, hence a 1-2 month wait time. 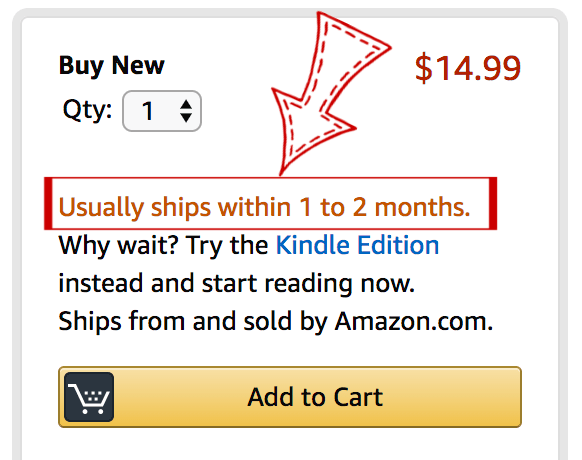 Most of these sites will offer a 1-2 week order period - this is pretty standard for print-on-demand books, and much better than the 1-2 months that Amazon offers. Booktopia - scroll to the bottom to find my books, there is another Australian author by the name of Jane Hinchey who writes travel books...I know, cool right? Now some of these sites are global and will ship anywhere so keep an eye on the postage prices if you do order from an overseas site. Also, I have no control over the pricing, I keep my paperback prices as low as possible but need to cover production costs - retailers will then add their own markups. And from time to time I will have available signed paperbacks on my website - although I usually announce it to my readers group on Facebook.